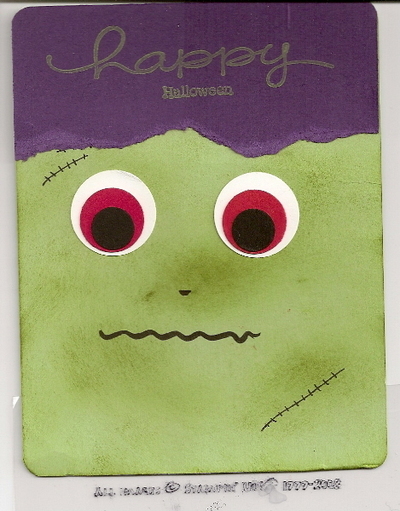 My wonderful upline, Sherrie Thomas, sent me this way-too-cute halloween card!! The only stamp set she used was the Happy Everything set! How creative is she?!!! The eyes are made with the 1", 3/4" and 1/2" circle punches!! 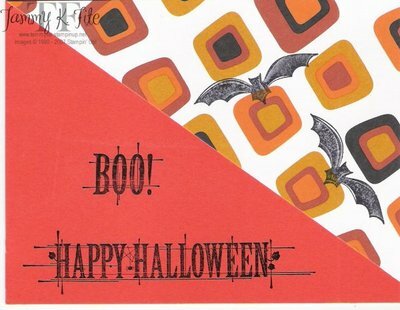 It's time to start thinking about your Halloween cards!! Now I know that we don't send out hundreds (like Christmas), but isn't it fun to send out a few!!! 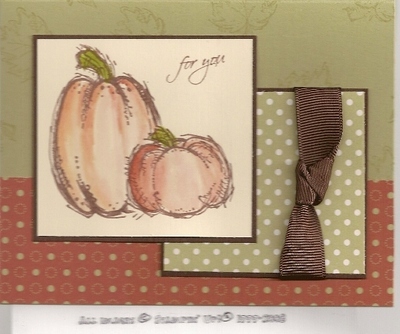 Here's a card made with the Autumn Harvest set! How economical can you get?! You can use this set for Halloween (yes, it includes the "face"), then use it again for Thanksgiving cards and decor, or fall/autumn scrapbooking!! Love it when I can use a set over and over!!! Pumpkin Pie and Basic Black ink. I stamped the pumpkin in Pumpkin Pie, then used an aquapainter to pull in the color. I told you I liked this one!! 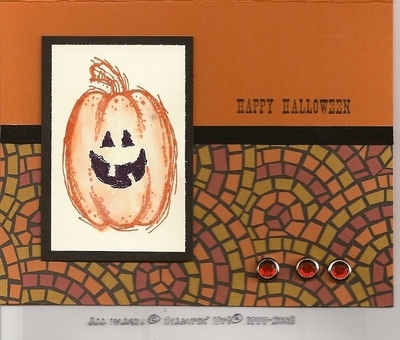 Here's another card created, using Beate's WSC20. And, look! I actually stamped on this one!! heehee!! Hi! I finally had some free time to stamp, so I decided to try Beate's Weekend Sketch Challenge #20. You can see her sketch here. Good afternoon!! I'm sorry I haven't posted in awhile. I am just recovering from a migraine--yikes, those really take me out for a few days!!! Last week, my husband bought me a brand new computer!! It's an HP, and is wonderful!! No more "freeze ups", and it's soooo fast!! But, now I can't figure out how to put my watermark onto the pics. So, things have been slow. Anyway, here is a two-pocket card that I made a few weeks ago! 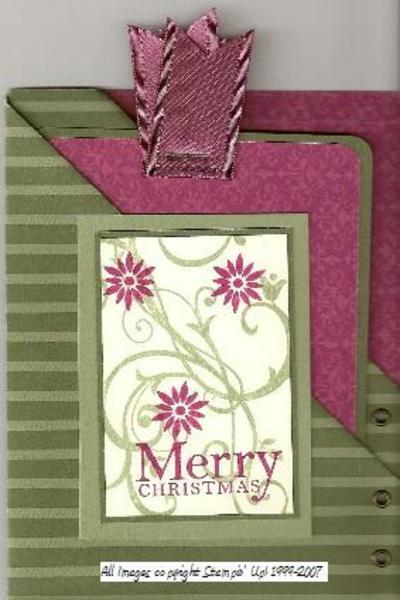 I used Purely Pomegranate and Always Artichoke for colors, and the designer paper is the Holiday Harmony from the Holiday Mini catalog. We'll make one of these in the Fun Folds class on October 12--see the previous post! Here are the inside pockets. One can be used for your message, and the other you could attach a photo to!! What a great Christmas card!! 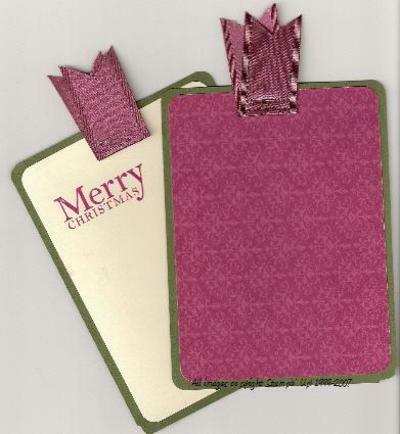 Come and make five fun holiday cards--each with it's own unique fold! Registration must be paid no later than Wednesday, October 3. (so I have time to order the paper!!) Fees are non-refundable, but if you can't make it, you will receive the packet of supplies!! Good morning!! I haven't stamped in 4-5 days!! Can you believe it?! Well, actually, I have been working on samples for my Fun Folds class--more details later!! Isn't it pretty? I love the colors she used! I tend to stick with the regals when I use this set--obviously, I need to branch out!! Thanks so much, Courtney! I had fun doing this challenge!! Good morning!! 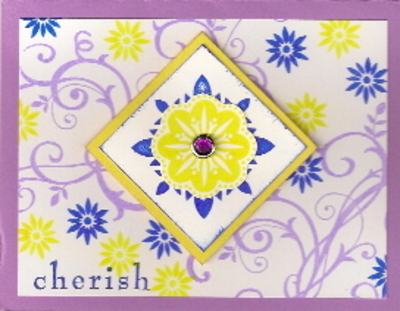 This is a card I received from my up-upline (think grandma in the Stampin' Up! world!!) for being the top 20 in sales for her group in August! I was so excited to receive it!! 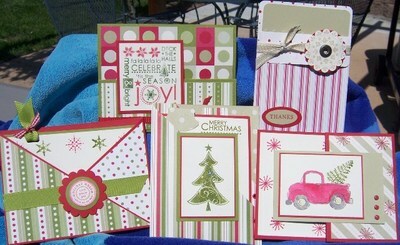 She used the Autumn Apparitions stamp set from the Holiday Mini catalog, as well as the Creepy Crawly Designer paper. It's very simple, but very cute!! Good evening! I'm so excited--tonight is my "Stamp with My Directs" night! This is always alot of fun! I've got two great projects planned for then, and then we'll just visit and talk about whatever they want! It's a criss-cross pocket card! The card in the middle will pull out, and you can write your message there! 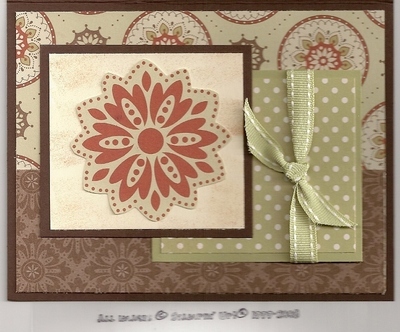 I used the Baroque Motifs stamp set and Brocade Backgrounds Designer paper. The colors are River Rock and Chocolate chip. The ribbon is the NEW Satin ribbon, found in the new Holiday Mini Catalog!! Soooooo pretty!! The rhinestone is the green from the Ice collection. It's hard to see in the scan, but it's sparkly!!! 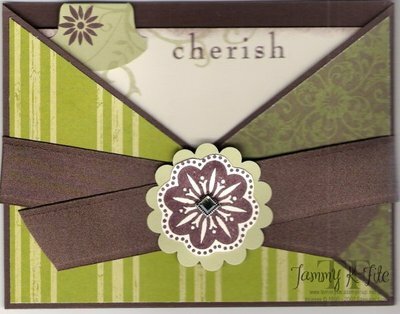 I am working on a Fun Folds Card class--this will be one the card folds we'll do! So, be on the lookout!! Please click on the link to access my montly newsletter!